At last, those cold wet eternal days of squelchy purgatory seem to have evaporated and it seems as though the sunshine will last, quite simply, forever. The cats are convinced of it. They are most fortunate cats: for the rickety fence which borders our back garden is simply a set of wooden slats between us and the most perfect feline playground anyone could ask for. It is a thicket of birch entangled with sticky, sinewy rhododendron, that Himalayan interloper which seems so at home in forest soils. Rhodedendrons shut out the light,but they also keep the keenest of winds out, and provide an adventurous moggie’s ideal habitat. Carpeted in dry leaf mould, the area is full of the shrubs which grow long limbs out sideways as well as upwards. In practice, this means catwalks: lots and lots of catwalks. There is no better place to ambush a fellow feline, and Monty can be seen, if one peers from the patio doors, stationary on a horizontal rhododendron limb, waiting for something, anything to jump out on. 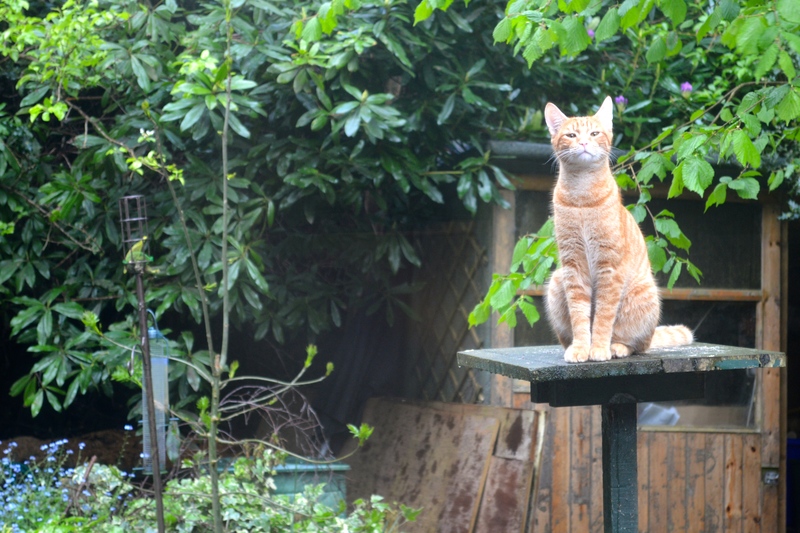 And not just Monty: staring at our little section of the forest is like a Where’s Wally book for cats. The longer you stare, the more you see. But it is, if you will, a moving Where’s Wally. Cat Chess (as outlined by Terry Pratchett) is being played the whole time. And to only Cat Chess, but a variant which I believe the local feline population has made especially for Macaulay the easily-baited terrier. It is my son Felix who noticed that cats have been having a laugh at the dog’s expense. The general gist of the lark is this: a cat takes position tantalisingly close to the old wooden slats of the fence, but still outside the garden. It waits until Macaulay is out pottering round, patrolling his land with a keen nose. they depend on the fact that his nose is not keen enough to smell an interloper. The cat waits until there is a clear path straight across the garden, across the flower beds, past the old disintegrating shed. And with eyes bulging triumphantly, and the timing of a guard at Charing Cross, the cat chooses his moment and then streaks hell-for-leather past the dog. The whole game hinges on the fact that the dog actually travels on a slower time-path than the cat. Thus, by the time he has actually registered the madcap bristling streak which occupied time and space in front of his eyeballs, that time and space has long, long gone. So that’s how the neighbourhood cats get their kicks when the muscly limbs of rhododendron become – well- tedious. But the cats who live with the dog are so young they do not yet know what tedium is. They are wired. Sent. Solid gone. Utterly absorbed in the drama of early summer in a little patch of woodland in Berkshire, England. Posted in Shrewsday MansionsTagged anglophile, Britain, cats, england, life style, pets, Summer, weatherBookmark the permalink. What fortunate kitties to have such a verdant playground, and such an unwitting target for their antics! 🙂 Love the photo. Monty in one of his more expansive moments, Karen. Is that the General. He looks so statuesque. It is indeed, Rafael. He has a commanding presence, doesn’t he? I hope this Operation Garden Market goes better than the last one. Doesn’t he retaliate with sound? That drives cats barking mad. Eventually, yes, Col: but the cat is gone by the time he realises it has dared to cross his territory, and then he has to send a courier to his brain to start the barking. By this time the cat is having a gin and tonic in a bar down the road. This gave me a good giggle! It goes all Midsummer-Night’s-Dream at this time of year, Sidey. I think information about that stuff is still marked Highly Classified, MTAC. That is a fantastic looking cat…a Yoda cat if ever I saw one. Wise beyond his years he is, Roger. The same happens to Reggie, but substitute cats for neighborhood squirrels. I could swear they’re laughing at him from the safety of a low-hanging tree limb. Ha! I know precisely what you mean. The squirrels take over dog- baiting duty in the forest, Jackie. It’s like one of those arcade games where figures come out from unexpected places and you have to take pot-shots at them. I’ll be cheering for Macaulay to figure out the demented cat games and turn the table and puts them in their place. 🙂 Go Macaulay!!! Perfect pose you captured, Kate. Hilarious post! I can imagine Mac looking completely bamboozled. Monty looks like he’s waiting for you to give him a medal, Kate, for orchestrating the bamboozling. Haughty pride is his thing, Virginia. Dives Mac nuts. I so enjoyed this, having been blessed with the presence of both dogs and cats most of my life. I often think that no one better exemplifies being totally present in the moment than a cat! So cat, and so dog. What a lovely tale! What a pose! For some reason reminds me of the Sphinx. Our cats are loving the sunshine. They are positively rolling around in it. Glad you are getting some there too. Poor pup . . . subject to such cunning cats. Cats just gotta have fun.